Illinois residents are fleeing the state in record numbers. The most recent U.S. Census numbers showed Illinois netted a loss of 114,000 residents to other states in 2018. That means Illinois lost 114,000 more residents than it gained from other states. Only New York, (-180,000) and California (-156,000) lost more residents on a net basis. New Jersey (-50,000) and Louisiana (-28,000) rounded out the top five largest losers of residents to other states. How does Illinois rank under an apples-to-apples comparison based on population? Illinois is still the nation’s third-biggest loser. 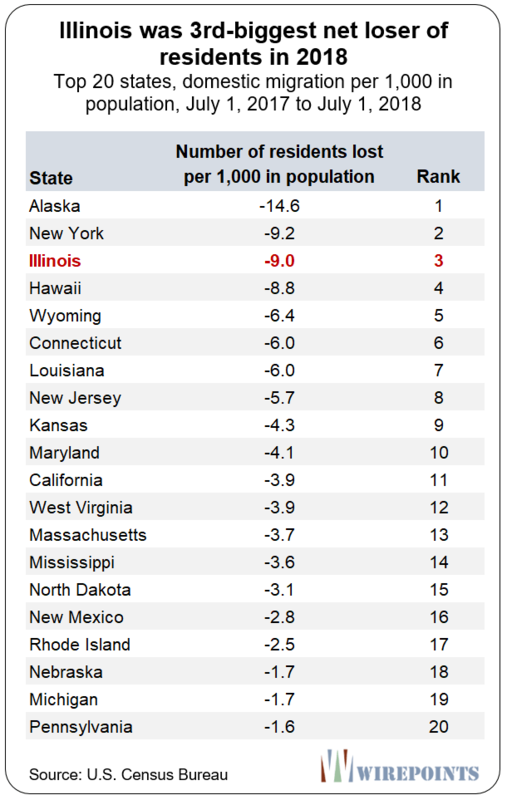 No matter how you cut the numbers, Illinois is an outlier when it comes to losing people. 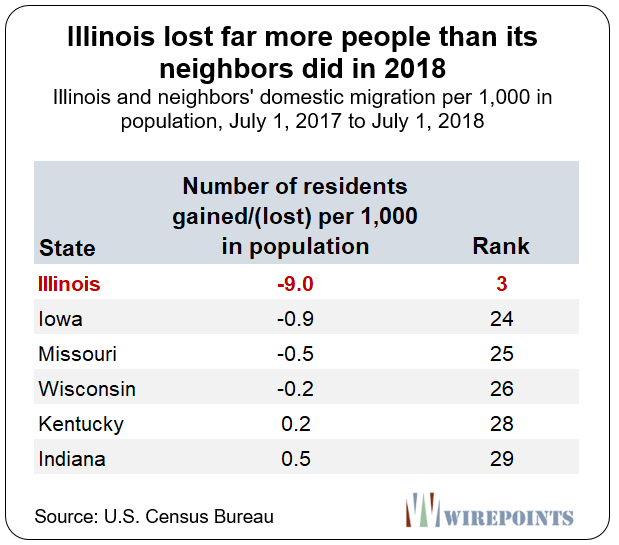 Illinois lost nine residents per 1,000 in population in 2018, third only to Alaska (-14.6) and New York (-9.2). Hawaii and Rhode Island rounded out the nation’s five-worst losers of residents to outmigration. In contrast, 22 states netted resident gains from other states. The biggest winner in the nation was Nevada, which added 15 residents for every 1,000 it had in population in 2018. Idaho, Arizona, South Carolina and Colorado rounded out the nation’s best performers. Illinois’ neighbors fared far better than Illinois, dispelling the notion that Illinois’ outmigration is simply a Rust Belt problem. 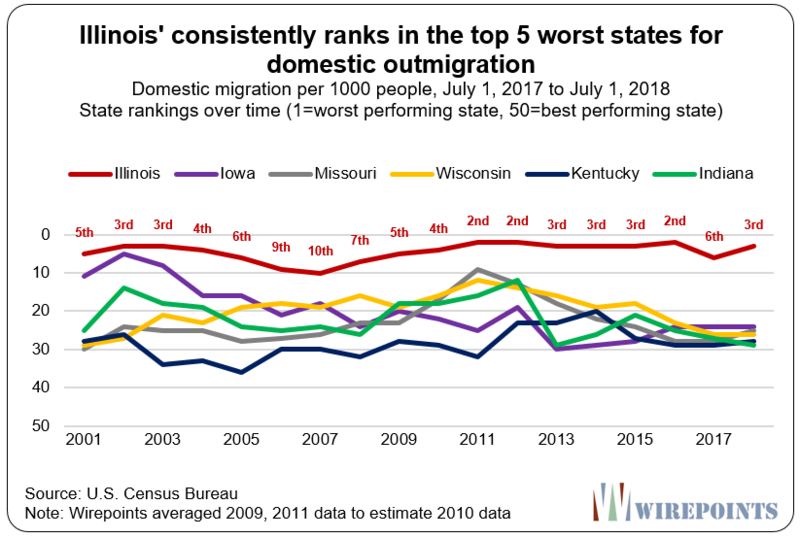 None of Illinois’ neighbors were on the list of the 20-worst performing states for outmigration. Iowa lost only one person for every 1,000 in population, while Missouri and Wisconsin had even smaller losses. And both Kentucky and Indiana actually squeaked out small net gains. Illinois’ 2018 out migration problem is not a one-off event. The state has consistently lost tens of thousands of people for years. 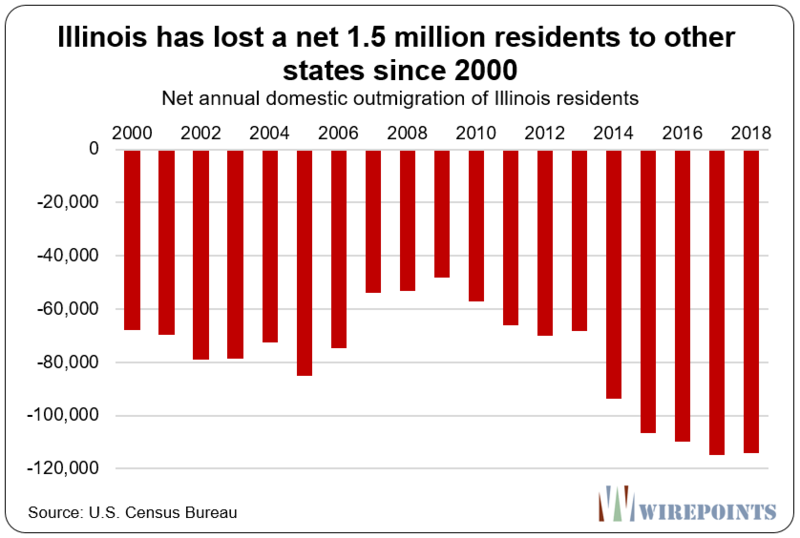 In total, Illinois has lost a net of 1.5 million people to other states since 2000. And when compared to other states over time, it becomes obvious that Illinois’ problem is chronic. Illinois has consistently ranked as one of the nation’s biggest losers of residents each year since 2001. Its average rank as a loser of residents over time is nearly 4th in the nation, where 1st is worst. Meanwhile, Illinois’ neighbors have consistently ranked near the middle of the pack. Illinois politicians can continue to ignore the massive mess they’ve created – from the country’s worst pension crisis to the nation’s highest property taxes to the lowest credit rating of any state. But as long as politicians fail to fix things, residents will continue to leave. And with them goes the tax base. You don’t have to wonder what the wake up call is going to be. If it’s not the exodus of Illinoisans, it’s going to be insolvency. Illinois’ tax base simply won’t support all the debt that’s been built up.